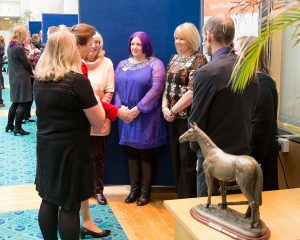 I t was a huge honour to welcome some o f our most loyal and longstanding supporters to Moredun last week, to be presented to our patron Her Royal Highness Princess Anne. 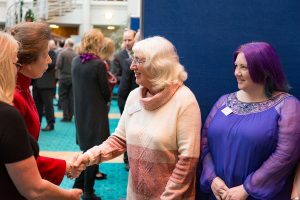 Mandy Mitchell, accompanied by volunteer Abigail Lee, was awarded the Heidi Award for her outstanding contribution to EGSF with her Avonvalley Tidy Memorial Show, which raised over £26,000 in the 16 years the show ran. 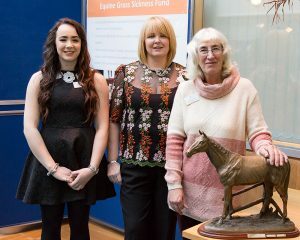 Presenting the award were Sam and Rebecca Seath, who donated this amazing trophy to EGSF in memory of their mare Heidi. Also in attendance were Yvonne and Mervyn Maclean, the only owners of a survivor to be present. Malbec survived the disease in 2014 and Yvonne and Mervyn have turned out to be genius fundraisers with their Black Isle Fun Show plus other antics. Committee member Lizzie Meadows represented the Fund in memory of Acw. Thank you to all of our supporters, your endeavours enable us to progress our mission to discover the cause and a means of prevention of this deadly disease. This small group of people were here on your behalf and we are truly grateful to each and every one of you.